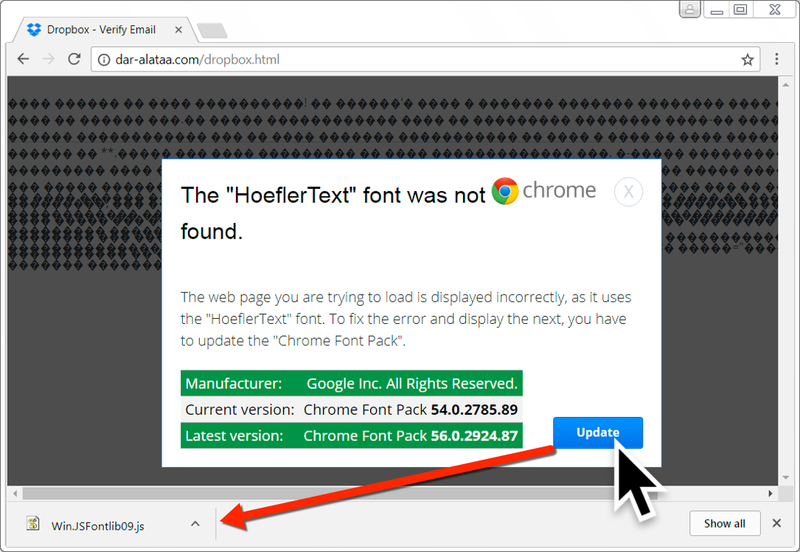 2017-09-01 update: A different campaign using HoeflerText popups has been active during the same timeframe. I wrote about it here, but the only thing these two campaigns have in common is that they both used HoeflerText popups. 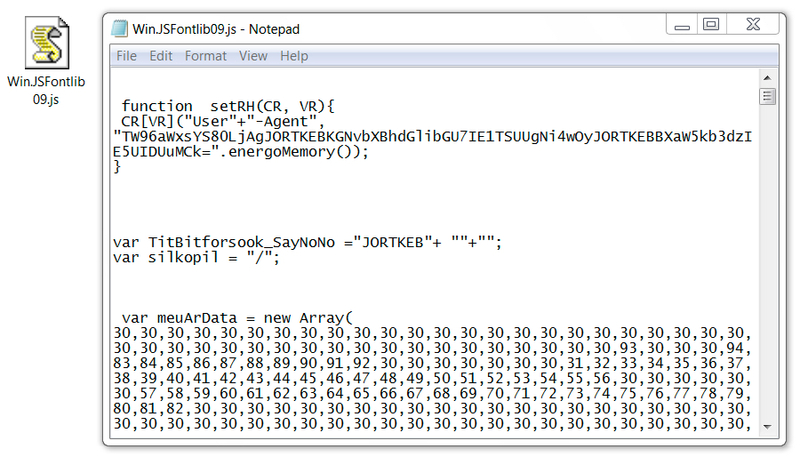 During past two weeks or so, we've seen plenty of botnet-based malicious spam (malspam) pushing Locky ransomware. In recent days, I've noticed multiple waves of malspam every weekday. It gets a bit boring after a while, but as 2017-08-31 came to a close, I noticed a different technique from this malspam. Of note, I was unable to get any malware when using Internet Explorer or Microsoft Edge. 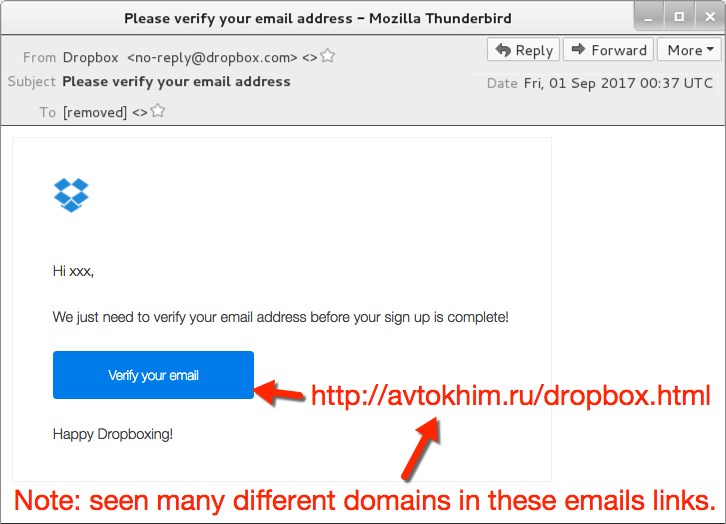 Each link from the malspam went to compromised sites hosting fake Dropbox pages. 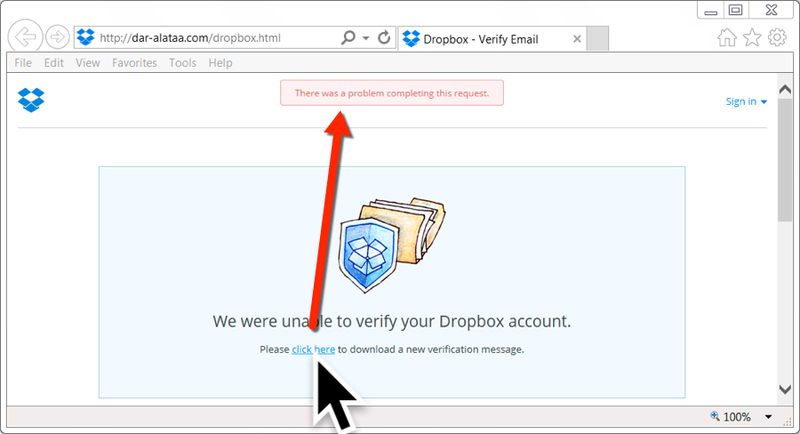 When I viewed the links in Internet Explorer 11 or Microsoft Edge, they merely showed a fake Dropbox page. I believe they should've returned something after I clicked a link in "Please click here to download a new verification message." But that didn't work for me. Shown above: Bogus site, but nothing when I tried it in IE or Edge. Shown above: Bogus site with a HoeflerText popup when viewing it in Chrome. Shown above: Bogus site with a HoeflerText popup when viewing it in FireFox. 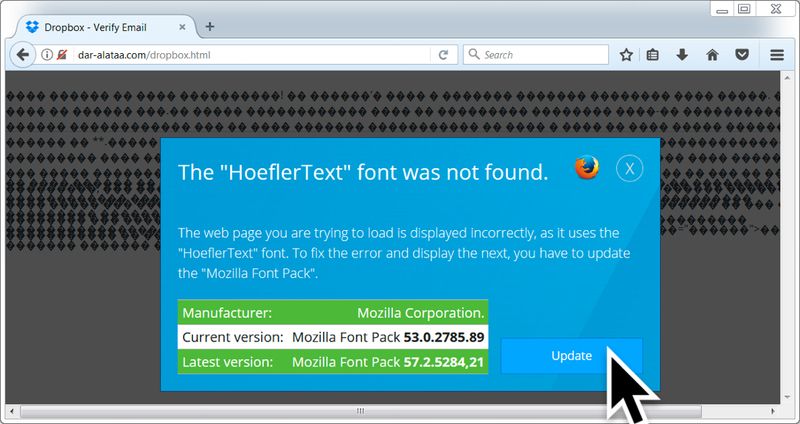 Shown above: Bogus site with a HoeflerText popup when viewing it in FireFox after clicking "update". I tried different browsers and had mixed results. Tor and Yandex browsers both returned the same results as IE 11 and Microsoft Edge when viewing those fake Dropbox pages. 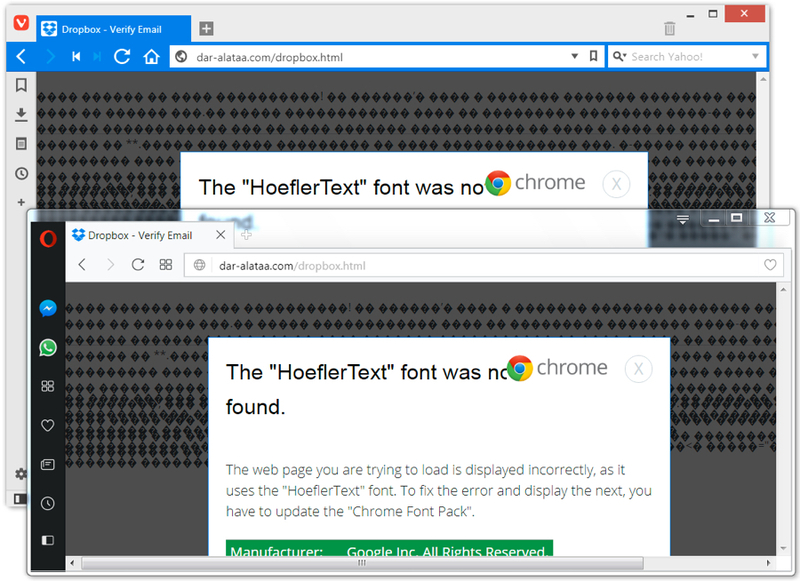 Opera and Vivaldi returned the same HoeflerText notifications seen in Google Chrome. Shown above: Bogus site in Opera or Vivaldi gave the Chrome notification. 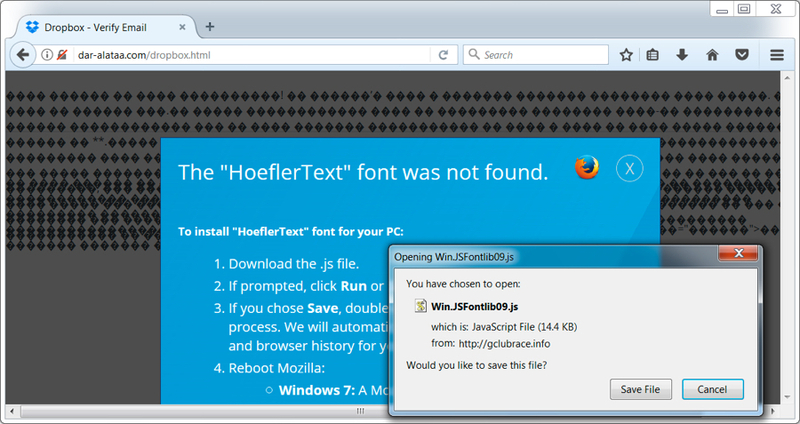 Shown above: Win.JSFontlib09.js from the fake HoeflerText notifications. 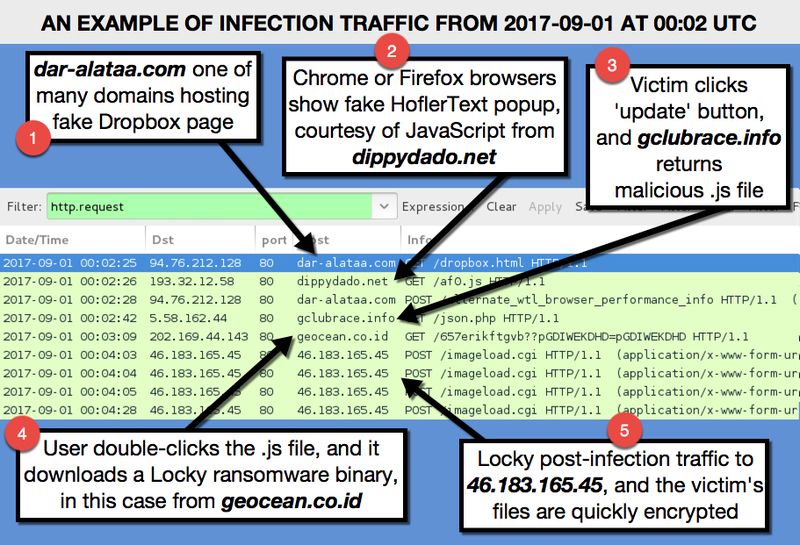 Network traffic wasn't too terribly different than what we've seen with other Locky infections. It just had an added step with the HoeflerText popup. The image below explains the network traffic from an infection in one of my lab hosts. The following are URLs I found from the malspam. They're "de-fanged" so you can't accidentally click on them and go to the fake Dropbox pages. Shown above: Desktop of an infected Windows host from my lab. Ultimately, this infection wasn't very innovative. 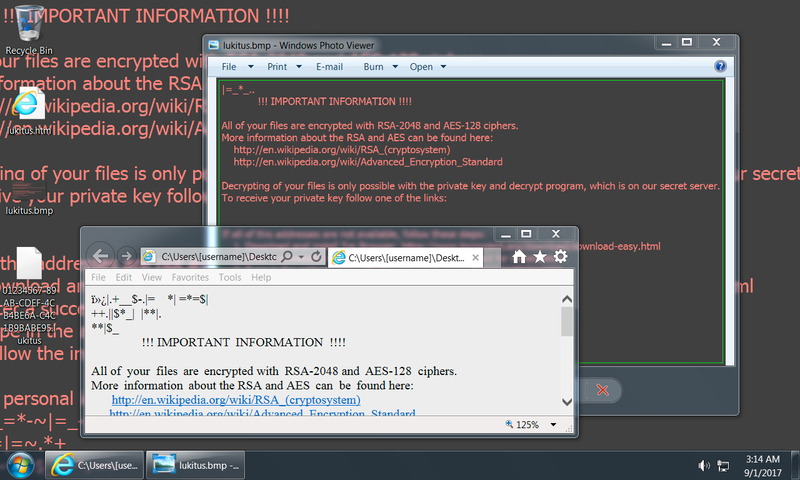 The ransomware was the "Lukitus" variant of Locky, which has been out for a while, and it's easily detectable. We've seen all the individual techniques used during the entire infection chain. However, it cobbled together some existing tricks like HoeflerText popups with fake Dropbox pages, so it briefly excited me as I looked into it. As always there are plenty of good practices that users and administrators can follow to avoid getting infected by this malware. A pcap of the network traffic can be found here. It's password protected with the standard password. If you don't know it, look at the "about" page of my blog at malware-traffic-analysis.net.